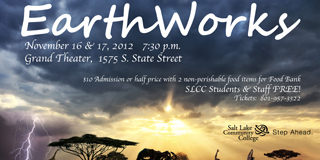 Salt Lake Community College Dance Company has gathered faculty and community dancers to perform with them in their fall concert titled, EarthWorks. This concert features dances that are inspired by the natural world around us, forces of nature, and elements of the earth. This is a multi-media performance with projected images and film coordinated with live dance. The concert includes exciting features, like a vertical dance on a climbing wall and an aerial silks artist. Community professionals, such as Rosie Banchero, Lindy McIlwaine, Ashley Mott, Erica Womack, and SLCC dance faculty are presenting their choreography on Friday and Saturday, November 16 & 17, 2012, at 7:30 p.m. in the Grand Theater, 1575 South State Street. Tickets are $8 or HALF PRICE if two non-perishable food items are brought in for the Utah Food Bank. SLCC students and staff receive FREE admission with a current SLCC I.D. and 2 food items. Local professional, Lindy McIlwaine is presenting movement piece on a rock climbing wall. Rosie Banchero, African dance specialist and SLCC faculty, has set a contemporary African piece on the company, with a ritualistic feel and live drummers. SLCC faculty, Ashley Mott is creating multi-media dances inspired by seasons of the year and water movement. Choreography by faculty Erica Womack, Sophia Gorder, Brian Benington and company director, Tess Boone, will also be showcased. In addition to the community college dancers, Aerial Arts of Utah company member, Trisha Paulos, will be featured. About this performance, Tess Boone, company director and Associate Professor of Dance explained, "This concert has a great deal of variety in movement and music, with an exciting visual component that will appeal to our digitally sophisticated audience. It is a good example of our commitment to the convergence of multi-media and performing arts here at SLCC." Purchase tickets online, or call (801) 957-3322. You can also visit the box office, located at 1575 So. State Street in Salt Lake City.